Evans’s account, especially of his days of student activism and travel, offers a unique perspective on the development of one of Asia’s most remarkable diplomats, who made his mark in regional peace-making and assuring international security. 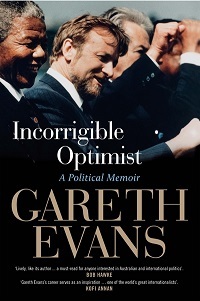 Written with verve and self-deprecating humor, Incorrigible Optimist offers the fascinating backstory of how many major foreign-policy initiatives were conceived and implemented and different policy battles were fought in the corridors of power and chambers of parliament. Evans’s memoir is particularly valuable for its candor and insight. In post-colonial Southeast Asia, ministers and diplomats mostly sprang from the Westernized elite and nobility, and for the most part they were inward-looking, determined as they were to avoid external interference and foreign entanglements. Only the end of the Cold War brought to the fore a need for greater regional co-operation and multilateral diplomacy. As these dynamics developed, a bright, international-minded Evans, the son of a tram driver in Melbourne, was preparing to be one of the first successful politicians to connect mainland Asia and its Western-allied neighbor to the south. What makes his memoir particularly fascinating is the account of his political awakening as a student leader drawn into anti-racist and civil-rights struggles. This offers a valuable clue to his long involvement in later years with peace, human rights and disarmament on the global scene. His interest in other societies and cultures, and the ways of the world, was further shaped by his travels during his student days. Invited by the US government on a student leadership program in 1965, Evans got his mildly pro-Vietnam war views challenged by the anti-war protest movement on American campuses. His views were further shaped three years later when, on his way to Oxford to take up a scholarship, he backpacked for six months through Asia and the Middle East, including the Saigon visit mentioned above. Starting as a young member of the Australian Law Review Commission, he rose to become an Australian Labour Party lawmaker, serving in both houses of parliament for 21 years. For 17 of those years, he was in the cabinet, eventually as minister of foreign affairs. As his lively and often humorous account makes clear, his skills honed in debating and jousting on the floor of parliament and in the party backroom were invaluable in his later years as foreign minister and international negotiator and mediator. Evans shuns the traditional chronological approach and presents his tale thematically. Chapters such as justice, race and enterprise recount his early years in Australian politics as attorney general, minister for resources and energy and minister for transport and communication in Labour governments. The legislative arcana might tire some non-Australian readers, but the chapters offer insight into the evolution of Australia from a white sanctuary to a vibrant multi-ethnic society that is very much a part of Asia. Five chapters are devoted to Evans’s nine intense years as foreign minister, managing relations with a volatile northern neighbor, Indonesia, and venturing into regional diplomacy with the Association of Southeast Asian Nations and world powers. The final three chapters trace his years as a world statesman at the UN, dealing with protecting civilians in civil war and nuclear disarmament; as chairman of the Brussels-based International Crisis Group, immersed in issues from genocide to civil strife; and his current role as the chancellor of Australian National University. One of his first acts as foreign minister was to show Australia’s commitment to Asia and play a creative role befitting a “middle power.” As someone deeply touched by the fact that all the young men he had met during his travels to Cambodia had vanished into the Khmer Rouge’s maw, he threw himself into the stalled Cambodia peace process. With the help of his colleagues, he put flesh on the idea of inserting the UN into Cambodia in peacekeeping, elections and interim administrative roles — something that allowed China a face-saving way to abandon the Khmer Rouge and eventually end the civil war. The red thread running through the book is his deep concern about creating a safe, just and equitable world. Concerns such as these, and his belief that the world can be made a better place, reveals the “incorrigible optimism” that has driven him to undertake what often could appear as a fool’s errand. He has met dismal failures, but also known great successes, and encountered decent individuals committed to improving the world. Evans retains great respect for the Chinese diplomats he dealt with over the years and cautions against overreacting to Chinese assertiveness — which is in some ways normal for a rising power after centuries of humiliation. But an indication of his lively and pragmatic mind is that he altered this view within a year after finishing the manuscript. Evans revised the notion that it was better to avoid the appearance of containing China. In a recent interview, with reference to strengthening the so-called “Quad” — Australia, Japan, the US and India — he told me: “I do think it is important that there be visible co-operation between all the other significant countries in the region to make it clear that we all value rule-based international order.” While Australia should value its economic relations with China and not be “too spooked by China’s chest-beating and wing-flapping,” he said, “we are not going to sit idly by and watch a steady encroachment of sovereignty in the South China Sea.” He wryly noted that a couple of countries — Cambodia and Laos — have become “wholly-owned” subsidiaries of China. Nayan Chanda is YaleGlobal Online’s founding editor and a Global Asia editorial board member. The review is reprinted from Global Asia. Nayan Chanda interviewed Gareth Evans at Yale University on February 15, 2018.